WASHINGTON (AP) - The firstprivate space ship took its place Wednesday next to Charles Lindbergh's Spiritof St. Louis, praised by its designer as a symbol of a new era of space tourismalongside the icon of trans-Atlantic flight. 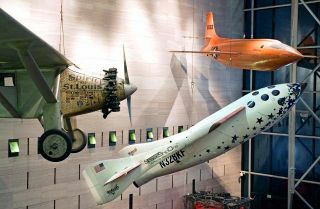 SpaceShipOne'sdesigner, Burt Rutan, and its financier, Microsoft Corp. co-founder Paul Allen,were on hand as the Smithsonian Institution's National Air and Space Museumtook ownership of the 28-foot star-spangled spacecraft. A year ago, Rutan and Allencaptured the $10 million (euro8.37 million) Ansari XPrize when SpaceShipOne dashed to the edge of space twice in five days. Theprize was aimed at encouraging space tourism through the development oflow-cost private spacecraft. Rutan told several hundredvisitors in the building's giant lobby that he was pleased the Smithsonian soquickly recognized the importance of SpaceShipOne. Likemany space entrepreneurs, Rutan thinks the private sector can do what NASAcannot: inspire tomorrow's astronauts and scientists by offering them the realpromise of a trip to space. NASA is phasing out the space shuttleand instead plans to return to the moon, for $104 billion (euro87.05 billion)over 13 years. It is a plan Rutan dismisses. "We'll go back to the moonby not learning anything new,'' Rutan said. He envisions a day in thenot-too-distant future when resort hotels orbit the earth and offer excursionsaround the moon. Federal AviationAdministration chief Marian Blakey shares his optimism. "I don't expect it will betoo long before we can all book an aisle seat 62 miles (99.77 kilometers) up,''Blakey said. There are signs thatSpaceShipOne's historic suborbital flights marked the dawn of a new space age. Of the 26 teams thatentered the Ansari X Prize competition, 10 are now viable companies, accordingto Ian Murphy, spokesman for the prize's successor, the X Prize Cup. Rutan has a deal withBritish entrepreneur Richard Branson, chairman of the Virgin Group, to build afleet of five spacecraft. The new company, VirginGalactic, will take passengers on 2 1/2-hour trips into space for $200,000(euro167,406) each. On Monday, X Prize founderPeter Diamandis announced in New York that he'd formed the RocketRacing League, which will take NASCAR style racing to 5,000 feet (1524meters). Diamandis' plans call for rocket planes to fly at about 300 mph(480kph) in league races that will start in about two years. Also Monday, GregOlsen, an American scientist and multimillionaire, was delivered by aRussian spacecraft to the international space station. He reportedly paid $20million (euro16.74 million) for the trip, organized by Space Adventures ofVirginia. Entrepreneurs already areselling their services to the government and to universities for researchpurposes. Three-year-old SpaceX, forexample, intends to become the first company to send a privately funded rocketinto orbit. SpaceShipOne's flight was suborbital. The California-basedcompany will launch its Falcon I from the Marshall Islands at the end of themonth. SpaceX spokeswoman Dianne Molina said the company has eight governmentand commercial contracts, and a contract with the Air Force.